In a spirit of adding as much information as possible. One of my affected Dell Laptops which I use less often ( I start up every 3-4 days or so) has just frozen again within a few minutes of startup. This is only the 3rd time this particular PC has frozen but each time it is within a relatively short time of startup which would suggest to me it is something within the software updating process that causes a conflict to occur. An almost identical Dell PC with the same software Win 7 32, Avast Free, MBAM Prem which I use daily and which has frozen several times is less likely to freeze within a short time of startup ie it is much more random, presumably because the software is already more up to date. I have not had a freeze since deactivating web protection on this particular PC. Well, this issue began just as the holidays rolled in, so you'll be seeing many more complaints as people return to work this week. This should be obvious. That said, I do appreciate that you have responded and acknowledged us 'night owls' during the holiday. Please respond to let us know if the freeze does/doesn't happen so we can rule out these changes. While we've gotten reports that disabling Web Protection solves the issue, current logs are pointing to Anti-Exploit potentially being part of the problem as well. Is it possible do not uninstall Malwarebytes 3 , but turn it off and install beta? Having the same freezing issue, goes away when I deactivate MB. Been all through this forum. Downloaded the tool, and created logs for your review. Thanks Mark_L. Unfortunately, the generated output is empty. Was the batch file run locally or from a remote system? If it was run from a remote system, would it be possible to run it locally on the affected machine? If it was run locally, what happens when you do the following? Open the extracted PSList folder containing the pslist64.exe. Click inside the address bar at the top of Windows Explorer and replace the folder path with "cmd". Press Enter. Type pslist64.exe and press Enter. Do you see output in the Command Prompt window listing the various running processes on the machine? Did that - attached is the screen shot of the output. Thank you for the screenshot. Are you running a 32-bit version of Windows? Please try repeating the same steps, only this time enter pslist.exe into the Command Prompt window. Great, thanks for confirming! This explains why the output files were empty. Would it be possible to carry out the earlier instructions once more please? This time ensure the PSList.bat file is run (not PSList64.bat). A folder will open. Open the PSList folder inside. Right-click PSList.bat and click Run as administrator. Your help with this issue is greatly appreciated. Yeah, ran the wrong file initially. Running now, waiting for freeze. Thanks for the info. If the machine freezes, please send us the output and we'll review it. 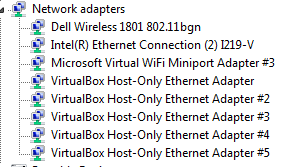 Here is network adapter info. The KB4471318 is not installed. Machine has not frozen since I turned MB back on this morning. PLList.bat still running. Below is my hardware info. I do have a CAVEAT with regard to MS updates on my systems, I remove & defer numerous updates due to MS 'telemetry', snooping, MS pushing Win-10 upgrades, and other annoying behavior from Redmond since 2015. Therefore, the most recent updates for the system below end at: KB315xxxx. I am still running script with PCList. Interestingly enough I had no freeze and I am on output5300.txt... I will run the script for one more night. Then I will reboot and try try to see freeze without script running. May be my next step will be uninstall KB4471318. BTW the system freezes started before 12/20/18. May be MS re issue this patch later? Finally got a freeze last night. However, file is too large to attach. And copy the link of the upload here. It is free and u can upload 2gb for free and your file automatically will deleted after a week.